The United Democratic Party (UDP), the National Reconciliation Party (NRP) and the Gambia Moral Congress (GMC), have jointly proposed a Tactical Alliance approach within the framework of the Coalition. The purpose of the Tactical Alliance is to achieve Coalition victory in the upcoming National Assembly elections scheduled for April, 2017. These parties strongly believe that the proposed Tactical Alliance would be the most effective approach for the consolidation of power by President Adama Barrow to enable him and his team to fulfill their mandate for reform and reconstruction in the Gambia. The “Gambians United for Change” rallies in 2013/2014. The 2016 UDP Congress resolution mandated the party leadership to negotiate with all opposition parties on the formation of a united front that would sponsor a single candidate to contest the presidential election. The formation in 2015 of the inter party Youth Forum initiated by Honorable Samba Jallow, the Minority leader, comprising several opposition parties. In March, GMC hosted a multi party meeting at Taibatu, URR with a view to facilitating the formation of a united front for the 2016 elections and paving the way for a single candidate for the 2016 presidential election. In furtherance of the efforts for political unity, the UDP, NRP and the GMC hereby call on all members of the Coalition to join them in implementing a Tactical Alliance strategy in the forthcoming elections. Coalition 2016 was formed for the sole purpose of selecting a unified opposition candidate to unseat the former President. The Coalition agreement dated October 17, 2016, dealt with the election of the presidential candidate. The agreement did not cover matters concerning the National Assembly elections. No agreement was reached on how the Coalition partners should cooperate in the sponsorship and selection of candidates for the forthcoming National Assembly election. However, in the spirit of continuing and maintaining the Coalition, the UDP, NRP and GMC have proposed a tactical alliance strategy among all the Coalition partners. This entails choosing a candidate whose party is strongest in a particular constituency or one who is markedly qualified to represent the Coalition in the said constituency. Under the UDP/NRP/GMC proposal, no member of the Coalition will sponsor a candidate in any constituency where the tactical alliance has selected a candidate. This approach will preserve and protect the Coalition spirit as well as the parties and their ideological positions within the Coalition. With this approach, a party will sponsor candidates in areas where it commands the highest support and its Coalition partners would give support and vice versa in the name of the Coalition. All National Assembly Members elected within the framework of the Tactical Alliance will owe allegiance to their various parties and will support the President and his transition government, in the Coalition spirit. The legislative agenda for the development of the country must be based on the collective (partisan) ideological plans and programmes developed by all the parties over the past 22 years. This cannot and must not be thrown away. To entrust the Nation’s legislative agenda to 53 independent representatives who do not have a common platform is recipe for chaos, confusion, inefficiency, constant stalemates and lack of direction. It would also create a disconnect between the well developed programmes of some of the political parties and the legislative activities of the elected members of the National Assembly. Each party has a right and duty to continue to assess the political realities and socio-economic needs of the country and to formulate legislative actions consistent with the party’s philosophy and vision. This would be lost if there is no party representation in the National Assembly. Legislators always caucus and form voting blocs based on political ideology and vision. This is an integral part of the legislative process in any democracy to achieve the development programmes of all political parties. The Tactical Alliance being proposed by the UDP, NRP and GMC will allow the Coalition National Assembly members to present a united front based on a common platform, as opposed to creating a chaotic situation whereby 53 National Assembly Members proceed on their own individual paths. The Tactical Alliance will promote accountability. The public will be able to judge the performance of the various parties based on their achievements in the National Assembly. 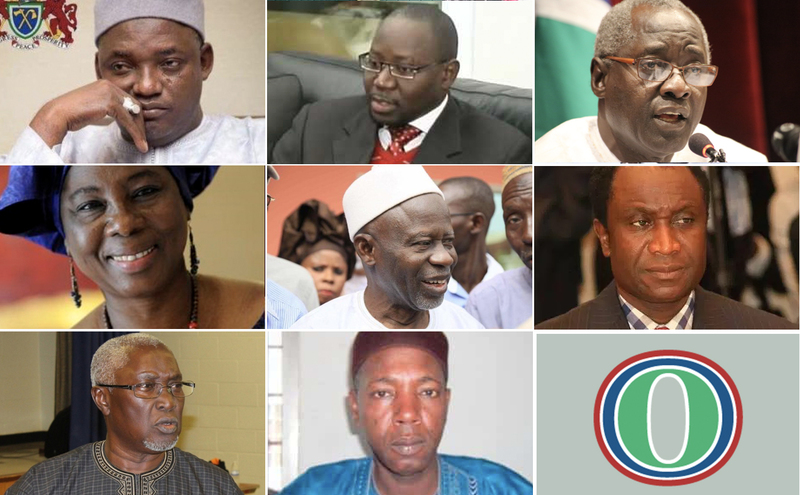 The UDP, NRP and GMC are opposed to the proposal of having 53 independent candidates because, in part, it prevents the Gambian citizens from being able to assign credit or blame for their legislative successes and failures. Finally, the UDP/NRP/GMC would like to reiterate that as founding members of the Coalition 2016 which removed Yahya Jammeh from power through the ballot box; their parties will continue to commit their support to the Coalition government of President Adama Barrow. Any rumor that these parties are not agreeing to an independent party platform and therefore have intentions of breaking or destroying the Coalition that they fought so hard to create, is not only false and deliberately misleading but utterly dishonest. The UDP/NRP/GMC wish to assure our Coalition partners and indeed the entire Gambian population that they will never relent from playing their part in the Coalition in the interest and well being of the Gambian Nation.